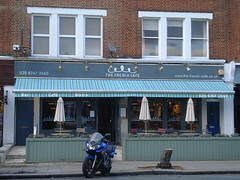 The French Cafe was a French bar/cafe/restaurant between Balham and Tooting. It closed down in 2017. French bar/cafe/restaurant between Balham and Tooting. The decor is clean and modern, but not garish. Unvarnished pale wood tables with hoop-backed chairs and flowers in small vases populate the drinking area at the front, while further back is a cosier dining area. A few more tables sit on a reasonably spacious patio out the front. Kake visited on a Wednesday early evening in October 2014. I was the only customer when I arrived around 5:30pm, but a couple of others soon arrived, and by 6pm there were half a dozen of us (including one child) and the place felt quite lively. It was relatively well-lit when I arrived, but the lights were turned down just after 6pm, making it just slightly too dim to comfortably read a book. Music was playing at a well-judged level — loud enough to add to the atmosphere but not loud enough to impede conversation. It's open all day, but food is only served at specific times; the website doesn't say when, but on the Wednesday of our visit the kitchen opened for dinner at 6pm. Kake tried a starter of duck liver pate with onion marmalade and toast (£6) photo. The pate was smooth and rich, with just a hint of subtle bitterness, contrasting well with the sweet, caramelised onion marmalade. The "toasted farmhouse bread" was rather uninteresting, just a fairly basic sliced white with the crusts cut off, and there wasn't quite enough of it for the amount of pate. The accompanying salad was fresh and nicely dressed. Service was friendly and efficient. A 12.5% service charge was automatically added to the bill. Accessibility: A ramp to get in. No steps to the toilets. The ladies' doubles as an accessible cubicle with pull-down baby change. Last visited by Kake, October 2014. Last edited 2018-03-04 16:55:23 (version 3; diff). List all versions. Page last edited 2018-03-04 16:55:23 (version 3).